Magnuson Children’s Garden is part of the 4-acre Magnuson Community Garden, one of the largest community gardens on the west coast. 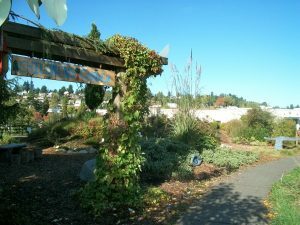 Magnuson Community Garden is a non-profit entity that also includes a P-Patch, Demonstration Orchard, Native Plant Border and Nursery, and Horticulture Therapy Garden, all surrounding a beautiful Amphitheater. 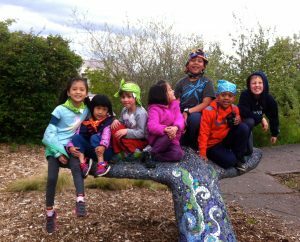 Magnuson Children’s Garden is a vibrant, interactive place, created by community volunteers using ideas that have been dreamed up by local children and their parents! The garden is filled with plants and other features that delight all the senses, is FREE to the public, and open 365 days a year for families to have self-guided scavenger hunts and other adventures. 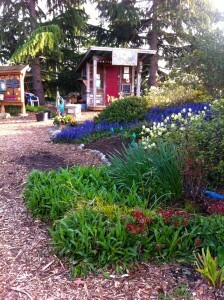 The Magnuson Children’s Garden Committee has guided the garden’s creation and its ongoing development since 2001. Committee members work together to host FREE, family-friendly monthly events each year from spring to fall. For the full calendar of 2019 events, visit our Events webpage! 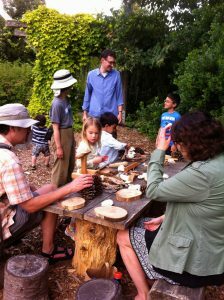 Our garden events feature drop-in nature exploration activities, community stewardship activities, plus fun and educational classes for the whole family to attend together. Each month’s class has a different theme and take-home project for kids too! All events include education and guidance from King County Master Gardeners and other experienced gardening teachers, hands-on exploration in the garden and p-patch plot, and plenty of simple stewardship tasks that are fun and easy for everyone. Tools, gloves, and refreshments are provided for all volunteers, and all events qualify as student service-learning. Our inter-generational nature walks feature a variety of fun and educational activities for children, parents, grandparents, and other adults. Each walk has a different theme, and all include guided wildlife identification and fascinating facts! Daytime walks also include pond-water sampling and other hands-on nature exploration activities, and free use of binoculars. Nighttime walks include use of a bat detector, spotting scopes, or Barn Owl pellet hunts and dissection. Through our new partnership with Seattle Audubon and Beavers Northwest, we are excited to have Master Birders and other local experts co-lead most of the walks! For more information about Magnuson Children’s Garden, visit our Sponsors and Partners webpage or How Can You Help? webpage. 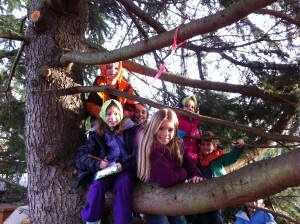 Or send us an email at magnusonchildrensgarden@gmail.com. Thanks! 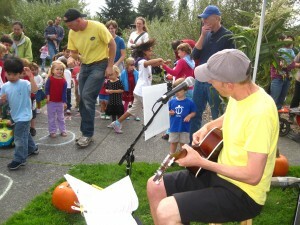 At the 2011 Fall Harvest Celebration, hundreds of kids and parents joined Caspar Babypants in singing Happy Birthday to the Children’s Garden to celebrate the 10 year anniversary of its creation! It’s so hard to believe that in less than 3 years, we will be celebrating our 20th Anniversary!